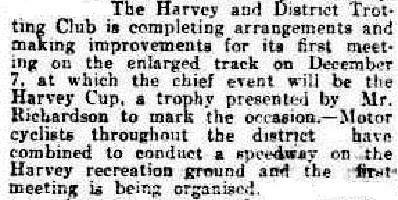 The Harvey and Districts Trotting club had been holding racing events at the Harvey Recreation Ground prior to 1928, In 1928 the track was increased in length and the idea of motorcycle racing was introduced. In 1936 the club had become incorporated. In December of 1928 it was reported that motorcycle racing events were going to be held at the Harvey Recreation Ground, The grounds were deemed to be suitable for such an event as it was already being used for horse racing by the Harvey and Districts Trotting Club, The trotting club was organising the motorcycle racing event.